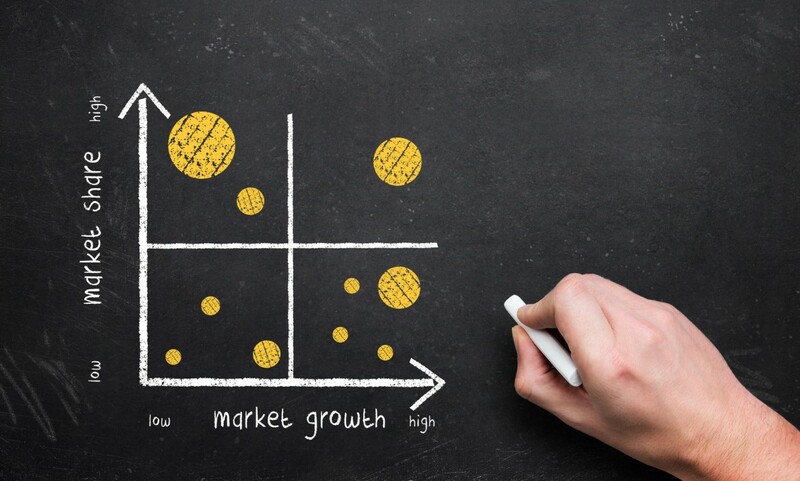 The BCG Matrix (also known as the Boston Consulting Group analysis, the Growth-Share matrix, the Boston Box or Product Portfolio matrix) is a tool used in corporate strategy to analyse business units or product lines based on two variables: relative market share and the market growth rate. By combining these two variables into a matrix, a corporation can plot their business units accordingly and determine where to allocate extra (financial) resources, where to cash out and where to divest. The main purpose of the BCG Matrix is therefore to make investment decisions on a corporate level. 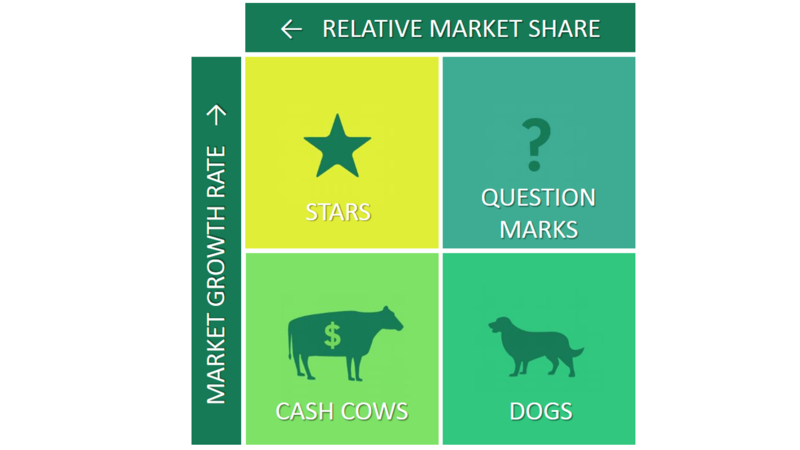 Depending on how well the unit and the industry is doing, four different category labels can be attributed to each unit: Dogs, Question Marks, Cash Cows and Stars. This article will cover each of these categories and how to properly use the BCG Matrix yourself. Samsung is a conglomerate consisting of multiple strategic business units (SBUs) with a diverse set of products. Samsung sells phones, cameras, TVs, microwaves, refrigerators, laundry machines, and even chemicals and insurances. This is a smart corporate strategy to have because it spreads risk among a large variety of business units. In case something might happen to the camera industry for instance, Samsung is still likely to have positive cash flows from other business units in other product categories. This helps Samsung to cope with the financial setback elsewhere. However even in a well balanced product portfolio, corporate strategists will have to make decisions on allocating money to and distributing money across all of those business units. Where do you put most of the money and where should you perhaps divest? 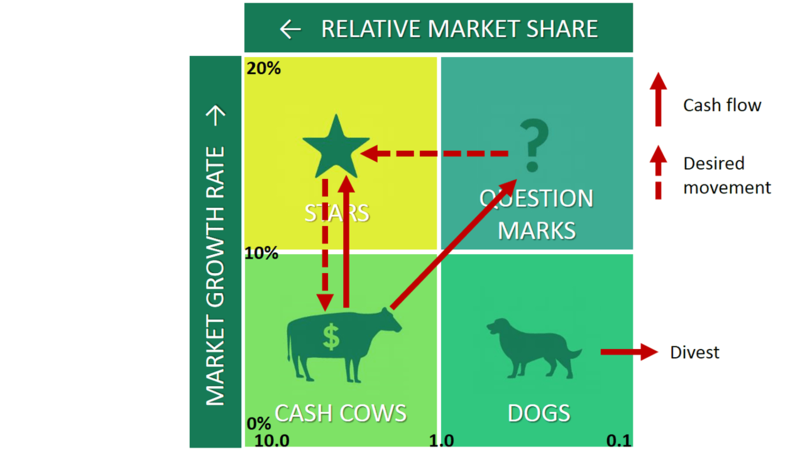 The BCG Matrix uses Relative Market Share and the Market Growth Rate to determine that. The creator of the BCG Matrix used this variable to actually measure a company’s competitiveness. The exact measure for Relative Market Share is the focal company’s share relative to its largest competitor. So if Samsung has a 20 percent market share in the mobile phone industry and Apple (its largest competitor) has 60 percent so to speak, the ratio would be 1:3 (0.33) implying that Samsung has a relatively weak position. If Apple only had a share of 10 percent, the ratio would be 2:1 (2.0), implying that Samsung is in a relatively strong position, which might be reflected in above average profits and cash flows. The cut-off point here is 1.0, meaning that the focal company should at least have a similar market share as its largest competitor in order to have a high relative market share. The assumption in this framework is that an increase in relative market share will result in an increase in the generation of cash, since the focal company benefits from economies of scales and thus gains a cost advantage relative to its competitors. The second variable is the Market Growth Rate, which is used to measure the market attractiveness. Rapidly growing markets are what organizations usually strive for, since they are promising for interesting returns on investments in the long term. The drawback however is that companies in growing markets are likely to be in need for investments in order to make growth possible. The investments are for example needed to fund marketing campaigns or to increase capacity. High or low growth rates can vary from industry to industry, but the cut-off point in general is usually chosen around 10 percent per annum. This means that if Samsung would be operating in an industry where the market is growing 12 percent a year on average, the market growth rate would be considered high. Ventures or start-ups usually start off as Question Marks. Question Marks (or Problem Children) are businesses operating with a low market share in a high growth market. They have the potential to gain market share and become Stars (market leaders) eventually. If managed well, Question Marks will grow rapidly and thus consume a large amount of cash investments. If Question Marks do not succeed in becoming a market leader, they might degenerate into Dogs when market growth declines after years of cash consumption. Question marks must therefore be analyzed carefully in order to determine whether they are worth the investment required to grow market share. Stars are business units with a high market share (potentially market leaders) in a fast-growing industry. Stars generate large amounts of cash due to their high relative market share but also require large investments to fight competitors and maintain their growth rate. Successfully diversified companies should always have some Stars in their portfolio in order to ensure future cash flows in the long term. Apart from the assurance that Stars give for the future, they are also very good to have for your corporate’s image. Eventually after years of operating in the industry, market growth might decline and revenues stagnate. At this stage, your Stars are likely to transform into Cash Cows. Because they still have a large relative market share in a stagnating (mature) market, profits and cash flows are expected to be high. Because of the lower growth rate, investments needed should also be low. Cash cows therefore typically generate cash in excess of the amount of cash needed to maintain the business. This ‘excess cash’ is supposed to be ‘milked’ from the Cash Cow for investments in other business units (Stars and Question Marks). Cash Cows ultimately bring balance and stability to a portfolio. Business units in a slow-growth or declining market with a small relative market share are considered Dogs. These units typically break even (they neither create nor consume a large amount of cash) and generate barely enough cash to maintain the business’s market share. These businesses are therefore not so interesting for investors. Since there is still money involved in these business units that could be used in units with more potential, Dogs are likely to be divested or liquidated. Taken all of these factors together, you can draw the ideal path to follow in the BCG Matrix, from start-up to market leader. Question Marks and Stars are supposed to be funded with investments generated by Cash Cows. And Dogs need to be divested or liquidated to free up cash with little potential and use it elsewhere. In the end, you will need a balanced portfolio of Question Marks, Stars and Cash Cows to assure positive cash flows in the future. If you want to know more about HOW to spend these investments in order to grow a business unit, you might want to read more about the Ansoff Matrix. Henderson, B. (1970). Growth-Share Matrix. BCG Perspectives.